Gosford Park is a 2001 British mystery film directed by Robert Altman and written by Julian Fellowes. The film stars an ensemble cast, which includes Eileen Atkins, Bob Balaban, Alan Bates, Charles Dance, Stephen Fry, Michael Gambon, Richard E. Grant, Derek Jacobi, Kelly Macdonald, Helen Mirren, Jeremy Northam, Clive Owen, Ryan Phillippe, Maggie Smith, Kristin Scott Thomas, and Emily Watson. 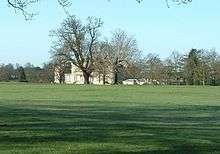 The story follows a party of wealthy Britons and an American, and their servants, who gather for a shooting weekend at Gosford Park, an English country house. A murder occurs after a dinner party, and the film goes on to present the subsequent investigation from the servants' and guests' perspectives. In November 1932, Constance, Countess of Trentham (Maggie Smith), and her lady's maid, Mary MacEachran (Kelly Macdonald) travel to Gosford Park for a weekend shooting party. On the way, they encounter actor Ivor Novello (Jeremy Northam), American film producer Morris Weissman (Bob Balaban) and Weissman's valet, Henry Denton (Ryan Phillippe), who are also attending the hunting party. At the house, they are greeted by Lady Trentham's niece, Lady Sylvia McCordle (Kristin Scott Thomas), her husband Sir William McCordle (Michael Gambon), and their daughter, Isobel (Camilla Rutherford). The other guests include Lady Sylvia's sisters, Louisa, Lady Stockbridge (Geraldine Somerville) and Lady Lavinia Meredith (Natasha Wightman) and their husbands, Raymond, Lord Stockbridge (Charles Dance) and Commander Anthony Meredith (Tom Hollander). Also in attendance are the Honourable Freddie Nesbitt (James Wilby) and his wife, Mabel (Claudie Blakley); Isobel's suitor, Lord Rupert Standish (Laurence Fox) and his friend Jeremy Blond (Trent Ford). The servants' hall is divided by a strict social hierarchy, dominated by the head housekeeper Mrs. Wilson (Helen Mirren). She maintains a hostile relationship with the head cook, Mrs. Croft (Eileen Atkins). Mary is immediately intrigued by Lord Stockbridge's valet, Robert Parks (Clive Owen), who is new to service and was raised in an orphanage. The head housemaid, Elsie (Emily Watson), takes a kindly interest in the naive Mary and guides her through the complexities of being in domestic service. Sir William is an extremely rich industrialist, and much of the company are dependent on him in one way or another. Commander Meredith is in on the verge of bankruptcy and is outraged when Sir William announces he intends to withdraw his investment in Meredith's latest business venture. Lady Sylvia reveals to her aunt that William may stop paying Lady Trentham's allowance. Freddie Nesbitt was having an affair with Sir Williams' daughter Isobel, and is blackmailing her to keep the secret of an aborted pregnancy. Likewise, Rupert Standish is trying to romance Isobel for her money. The next morning the men go out early on a pheasant shoot, and Sir William is slightly injured by a stray birdshot. Later, the ladies join the gentlemen for an outdoor luncheon on the estate grounds, where Commander Meredith pleads with Sir William not to back out of the investment. Dinner that evening is tense and sombre. As the conversation progresses, tempers flare and Lady Sylvia attacks Sir William, implying that he was a First World War profiteer. Elsie rises to his defence, breaking the class barrier, and thus revealing her affair with Sir William to everyone at the table. Everyone watches in shocked silence at this indiscretion, and Elsie hurries from the room—knowing that she will be dismissed. Sir William abruptly storms away from the dinner table and goes to the library, where the housekeeper, Mrs. Wilson (Helen Mirren) brings him coffee. He demands a glass of whisky instead. Lady Sylvia asks Mr. Novello to entertain the guests. During the concert, George (Richard E. Grant, first footman), Parks, Mr. Nesbitt and Commander Meredith disappear. An unknown person goes to the library and stabs Sir William as he sits slumped in his chair, apparently sleeping. Minutes later, Lady Stockbridge goes to the library to entice Sir William to return to the party and her screams bring everyone to the room. Commander Meredith and Mr. Nesbitt do not offer an explanation of their disappearances, while George says he was fetching milk for the coffee service and Parks claims to have been fetching hot water bottles. Inspector Thompson (Stephen Fry) and Constable Dexter (Ron Webster) arrive to investigate the murder. Dexter suggests that Sir William was already dead when he was stabbed. It is eventually discovered that Sir William was poisoned before being stabbed. Inspector Thompson uncovers a complex web of resentments between the guests and Sir William, realizing that almost everyone had a motive to murder him. Mrs. Croft, meanwhile, tells her kitchen staff that Sir William was known for seducing the young girls working in his factories. If a woman became pregnant, Sir William offered two choices: keep the baby and lose your job, or give the baby up and keep your job. Those who gave up their babies were told that the adoptions were being arranged with good families. In reality, Sir William paid squalid orphanages to take the children. Mary goes to Parks' room and tells him that she knows he is the murderer. Parks tells her that he discovered Sir William was his father, entered service and attempted to gain employment with someone in his circle. Parks tells Mary that he only stabbed the corpse, someone else had already poisoned Sir William beforehand. Mary overhears a conversation between Lady Trentham and Lady Sylvia, who discloses that both Mrs. Croft and Mrs. Wilson were once workers in Sir William's factory. Lady Trentham asks if Mrs. Wilson was ever married and Lady Sylvia replies that her name was once Parks or Parker. Mary makes the connection and goes to Mrs. Wilson, who admits that she poisoned Sir William after realizing that Parks was her son, assuming correctly that he was there to murder his father. She also reveals that she and Mrs. Croft are sisters. Mrs. Croft kept her own baby from Sir William, who later died from scarlet fever, while Mrs. Wilson gave hers up, creating a life-long rift between the two sisters. Inspector Thompson decides that it is impossible to trace the poison used to kill McCordle, and concludes that it was an intruder and would-be thief who killed Sir William, despite all evidence to the contrary. The guests depart one by one, while Mrs. Croft comforts her grieving sister in private, putting to rest their feud. The film is a study of the British class system during the 1930s; Stephen Fry, Inspector Thompson in the film, says that it shows the upper class's dependency on a servant class. A number of secondary themes are also explored. For example, the film takes a subtle look at sexual mores during the 1930s. As it is set in 1932, between the world wars, the impact of the First World War is also explored in the film's screenplay. It also mentions the decline of the British Empire and the peerage system. Writing for PopMatters, Cynthia Fuchs described surface appearances, rather than complex interpersonal relationships, as a theme of the film. Themes from the film were picked up and integrated into the series Downton Abbey by Julian Fellowes. Maggie Smith starred again in her role as a dowager countess, this time her title not being Trentham but Grantham. In 1999, Bob Balaban asked Robert Altman if there were something they could develop together, and Altman suggested a whodunit. Altman wanted to create an Agatha Christie-like country house murder mystery that explored that way of life; he called the film a "classic situation: all suspects under one roof". Altman was also inspired by the 1930s films, The Rules of the Game and Charlie Chan in London. Altman chose British actor and writer Julian Fellowes to write the screenplay, because Fellowes knew how country houses operated. Fellowes, who had never written a feature film before, received a telephone call from Altman, who asked him to come up with some characters and stories. Fellowes was given a brief outline of the film: it was to be "set in a country house in the '30s and to have a murder in there somewhere, but for it to really be an examination of class". Altman also wanted the film to explore the three groups of people: the family, the guests, and the servants. Of the call, Fellowes said, "All the way through I thought this can't be happening - a 50 year old fat balding actor is phoned up by an American movie director - but I did work as if it was going to happen". Fellowes says the screenplay was "not an homage to Agatha Christie, but a reworking of that genre". Fellowes was credited not only as the film's writer but as a technical advisor as well, meaning he wrote portions of the film as it was being produced. He notes that in certain large scenes with many characters, the actors were left room to improvise. The film received critical acclaim; review aggregator Rotten Tomatoes reports that 86% of 152 critics have given the film a positive review, with an average rating of 7.5 out of 10. According to the site's summary of the critical consensus, "A mixture of Upstairs, Downstairs; Clue; and perceptive social commentary, Gosford Park ranks among director Altman's best." Metacritic, which assigns a score of 1–100 to individual film reviews, gives the film an averaged rating of 90 based on 34 reviews, indicating "universal acclaim". Roger Ebert awarded it his highest rating of four stars, describing the story as "such a joyous and audacious achievement it deserves comparison with his [Robert Altman's] very best movies". Ebert specifically noted a quality of the film that many Altman films share: a focus on character rather than plot. Emanuel Levy, an independent critic, gave Gosford Park an A minus rating. He described one of its themes as "illuminating a society and a way of life on the verge of extinction", placing the interwar setting as an integral part of the film's class study. However, he notes that because Altman is an independent observer of the society he portrays in the film, it does not have the biting qualities of his previous social commentaries such as Short Cuts, set in the director's home country of the United States. Jonathan Rosenbaum in the Chicago Reader called it a "Masterpiece". Gosford Park was nominated for 61 different awards following its release, winning 25 of them. There were seven nominations for Academy Awards (including Best Picture and Best Director, both of which it lost to A Beautiful Mind); Fellowes won the Best Original Screenplay. At the 55th British Academy Film Awards, the film was nominated for nine British Academy awards, winning Best Film and Best Costume Design (Jenny Beavan). Mirren, Smith and Watson were all nominated for Best European Actress at the European Film Awards. The film received five nominations at the 59th Golden Globe Awards; Altman won the Award for 'Best Director'. 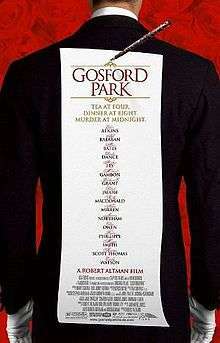 The region 1 DVD of Gosford Park was released on 25 June 2002, with the region 2 release on 3 December 2002. The critic Ed Gonzalez reviewed the DVD negatively, calling the picture quality "atrocious on the small screen", going on to say that "the image quality of this video transfer is downright lousy from start to finish". However, reviewer Robert Mack generally wrote favourably of the picture quality, noting excellence in the shots' detail and sharpness and the lack of compression artefacts, but describing an unfavourable darkness to scenes filmed within the manor house. Both reviewers commented positively on the film's score and soundtrack. Gonzalez wrote that "Gosford Park sounds amazing for a film so dialogue-dependent" and Mack that "the audio transfer is about as good as it can get on a movie of this style". Patrick Doyle composed the film's score. Doyle said that it can take him up to six months to create a film score, but Altman asked him to write and compose the music for Gosford Park in less than five weeks. Doyle recorded the soundtrack at the London Air-Edel Recording Studios in October 2001. The soundtrack also features six original songs by composer and playwright, Ivor Novello.Jeremy Northam, who plays Novello, sings all the songs and his brother, Christopher, accompanies him on the piano. The soundtrack was released on 15 January 2002. 1 2 3 "Gosford Park (2001)". Box Office Mojo. Internet Movie Database. Retrieved 7 August 2010. 1 2 "Robert Altman's career in films". BBC News. BBC. 22 November 2006. Retrieved 7 August 2010. 1 2 Miller, Danny (Director); Gill, Kevin (Executive Producer) (14 December 2001). The Making of Gosford Park (DVD). USA Films. ↑ Holden, Stephen (26 December 2001). "Full of Baronial Splendor and Hatefulness". The New York Times. Retrieved 26 April 2008. ↑ Fuchs, Cynthia (27 June 2002). "Gosford Park". PopMatters. Retrieved 26 April 2008. ↑ Johnson, Steven (24 January 2002). "The ghosts of "Gosford Park"". Salon.com. Retrieved 26 April 2008. 1 2 3 4 5 Peary, Gerald (December 2001). "Robert Altman". Gerald Peary. Retrieved 9 August 2010. 1 2 3 4 "Profiles - Julian Fellowes". BBC Dorset. BBC. 8 August 2005. Retrieved 9 August 2010. 1 2 3 Hoge, Warren (15 April 2002). "'Gosford' Writer Is Unfazed by Class but Amazed by Fame". The New York Times. The New York Times Company. Retrieved 10 August 2010. 1 2 3 Hammond, Pete et al. (8 March 2002). Cast and Filmmaker's Q&A Session (DVD). USA Films. ↑ "Obituaries: Ruth Mott". The Daily Telegraph. 24 August 2012. Retrieved 8 June 2015. ↑ "Serving the Good and the Great: The Amazing True Story of Violet Liddle". Amazon.com. 2015. Retrieved 8 June 2015. ↑ Morrison, James (3 February 2002). "Gosford Park Syndrome: go see the movie, but please don't peek at one's stately home". The Independent. Independent News & Media. Retrieved 7 August 2010. ↑ "Gosford Park". The Castles and Manor Houses of Cinema's Greatest Period Films. Architectural Digest. January 2013. Retrieved 2 January 2013. 1 2 3 Ebert, Roger (2 January 2002). "Gosford Park". Chicago Sun-Times. Sun-Times Media Group. Retrieved 26 April 2008. ↑ Staff. "Filming locations for Gosford Park (2001)". Internet Movie Database. Amazon.com. Retrieved 26 April 2008. ↑ "Andrew Dunn BSC tracks mysterious movements at Gosford Park" (PDF). In Camera. Eastman Kodak. January 2002. pp. 4–5. Retrieved 26 April 2008. ↑ Wood, Jennifer M. (3 February 2007). "Breaking Away". MovieMaker. Retrieved 1 May 2008. ↑ "High Hopes For London Film Festival 2001". The Guardian. Guardian Media Group. 8 November 2001. Archived from the original on 2 August 2012. Retrieved 4 October 2016. ↑ "All About Gosford Park". Entertainment Weekly. Time Inc. Archived from the original on 22 July 2010. Retrieved 4 October 2016. ↑ Smith, Neil (31 January 2002). "Gosford Park (2002)". BBC Films. BBC. Archived from the original on 22 July 2010. Retrieved 4 October 2016. ↑ "Gosford Park (2001)". Rotten Tomatoes. Flixster. Retrieved 30 July 2012. ↑ "Gosford Park". Rotten Tomatoes. Flixster. Retrieved 30 July 2012. ↑ "Gosford Park". Metacritic. CNET Networks. Retrieved 6 August 2009. 1 2 Levy, Emanuel. "Gosford Park". EmanuelLevy.com. Retrieved 27 April 2008. ↑ Rosenbaum, Jonathan (18 January 2002). "A Touch of Class [GOSFORD PARK]". JonathanRosenbaum.net. Retrieved 10 March 2015. ↑ Clinton, Paul (4 January 2002). "Review: 'Gosford Park' a winning mystery". CNN. Retrieved 26 April 2008. 1 2 3 Gonzalez, Ed (26 May 2002). "DVD Review: Gosford Park". Slant Magazine. Retrieved 26 April 2008. ↑ Phillips, Michael. "At the Movies". At the Movies. Retrieved 2 November 2009. ↑ "Best of the Aughts: Film". Slant Magazine. Retrieved 10 February 2010. ↑ "Rings Leads Oscars Race". BBC News. BBC. 12 February 2002. Retrieved 23 July 2010. ↑ Gibbons, Fiachra (25 February 2002). "Lord of the Rings Is King of the Baftas". The Guardian. Guardian Media Group. Retrieved 19 July 2010. ↑ "People's Choice Awards 2002 – The Nominees". European Film Awards. Retrieved 7 August 2010. ↑ "Golden Globes: 2002 Winners In Full". BBC News. BBC. 20 December 2001. Retrieved 7 August 2010. ↑ "Screen Actors Guild Honors Outstanding Film & Television Performances in 13 Categories at the 8th Annual SAG Awards". Screen Actors Guild. 3 October 2002. Retrieved 7 August 2010. ↑ "The 7th Critics' Choice Awards Winners And Nominees". Broadcast Film Critics Association. Retrieved 7 August 2010. ↑ "FFCC Award Winners". Florida Film Critics Circle. Retrieved 7 August 2010. ↑ "Online Film Critics Society Awards for 2001". Online Film Critics Society. Archived from the original on 14 February 2010. Retrieved 7 August 2010. ↑ King, Susan (3 March 2002). "Writers Honor 'Gosford Park,' 'Beautiful Mind'". Los Angeles Times. Tribune Company. Retrieved 7 August 2010. ↑ "AFI Awards 2001". American Film Institute. Retrieved 7 August 2010. ↑ "World Soundtrack Awards 2002". World Soundtrack Academy. Flanders International Film Festival. Retrieved 7 August 2010. 1 2 Mack, Robert. "Gosford Park". DVD.net.au. Retrieved 27 April 2008. 1 2 Cripps, Charlotte (15 October 2007). "Preview: Music from the movies, Royal Albert Hall, London". The Independent. Independent News & Media. Retrieved 5 August 2010. ↑ "Gosford Park Soundtrack CD". CD Universe. Retrieved 5 August 2010. ↑ "The Brits who are making a big noise in Hollywood". The Independent. Independent News & Media. 29 March 2010. Retrieved 5 August 2010. 1 2 "Master And Servant". Newsweek. Sidney Harman. 17 January 2002. Retrieved 5 August 2010. ↑ "Gosford Park: Original Motion Picture Soundtrack". Amazon.com. Retrieved 5 August 2010.